$3 Million Dollar Sportsbar just 3 blocks away from the Rugby Park. This opened in March 2016 with Brick Oven Pizza, along with a sports bar theme that is basically Buffalo Wild Wings, Applebee’s, Famous Dave’s all into one. 1,700 Square feet indoors along with (2) $50,000 golf simulators inside. Outdoors with 2 sand volleyball courts, 3 basketball courts and archery range. All this is just 2 ½ blocks from the rugby park. For those coming to Wayne for the first time, as you see the Wayne Rugby Park, has an excellent location with 3 motels and 5 places to eat just 1-3 blocks from the Rugby Park. Many teams simply walk to the tournament. The back of a Try-Zone on Field #5, actually touches the property line of the Cobblestone and Suits. Have you been to a big city tournament? How far do you have to drive from your motel to the rugby area? How far do you have to go after the game to eat? 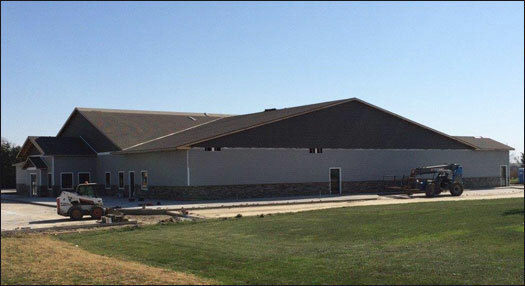 “Walk –Able” in Wayne, Nebraska !! Now When in Wayne on Tournament weekend, make sure to take BIG TIME advantage of THE MAX Sports Bar on 1st and Main St. Look at the photo’s below and see what you can get on Friday and Saturday at The MAX. This works out great since THE MAX on 1st and Main is just a half block from the MASSIVE TOGA DANCE and Rock Concert for the Rugby Social with 1,700 ruggers will be dancing all night Sat after a big meal. 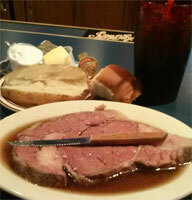 Please ask yourself this, when at other tournaments can you get a $12 Prime Rib? Or a $12 Steak Dinner? This includes a side order with your big meal. As you can see, Wayne is the location where REF’s LOVE to come for a rugby weekend along with Union administration. Motel, Food and Drink prices are not even comparable to other big city tournaments. 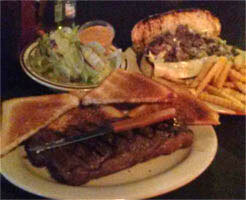 Check out the BIG MEALS BELOW FOR JUST $12!! $12 meal photos below from THE MAX! The Max is located on 1st and Main St. downtown. Can you get this at any big city tournament? Meat is way bigger than the 11" knife, EXTRA Thick Cut. ONLY 1 block from Rugby Social! How much would this cost at a big city tournament?